Were you able to mix and match colours accurately? Overall yes. I sometimes had some trouble, for instance getting just the yellow I wanted, but with perseverance and the tools I have collected I was able to get a result that pleased me. 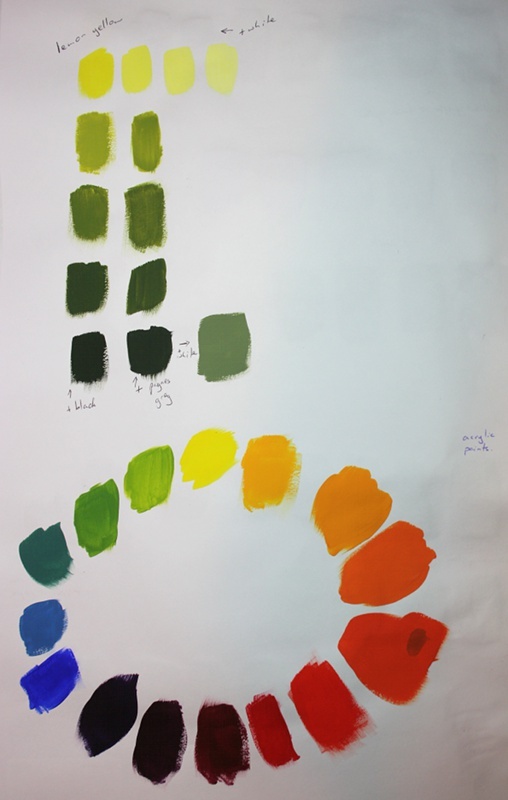 Were you able to use colour expressively? This is the weakest part of the work. 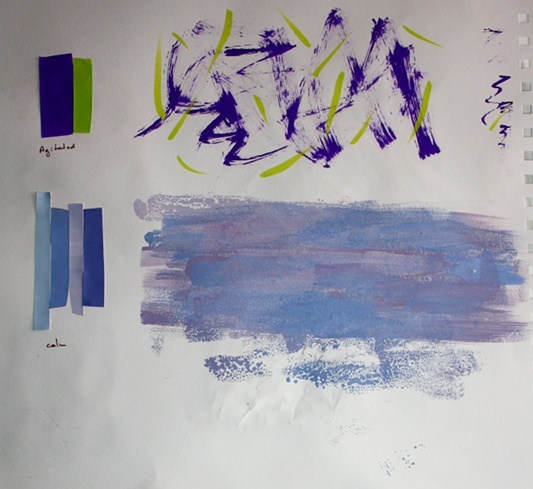 I found it difficult to juggle all the things I was trying to think about – selecting colour, mixing, mark making… I also started second-guessing my reactions – what were just clichés and what really meant something to me? It’s all about context – partly cultural, but also a colour in one grouping can appear differently in another – and I’m thinking of emotional difference, not optical effects. There is definitely more development needed. Can you now see colour rather than accepting what you think you see? This is a skill that takes a long time to develop. I think I’ve made a decent start. Did you prefer working with watercolours or gouache paints? What was the difference? I did most of the work in gouache, with just a little watercolour and acrylic. Gouache is easier to use to get a flat, solid colour, which I thought more appropriate for the exercises. Watercolour’s transparency has advantages in the right circumstances, but not here. I wanted to do the colour mixing on the palette, not by layering on paper. How successful were the colour exercises in Stages 5 and 6? How did they compare to the painting exercises? All of the exercises were successful in the sense that I learnt from them and looking at them triggers ideas and questions for future exploration. They hint at some of the possibilities, and I’m glad I used both hand and machine stitching because they seem to offer such different things. Painting is much quicker than stitching, for me at the level I’m working. There is also the advantage that you can mix up colours as you go, rather than being restricted to the particular yarns and threads on hand (I can always dye more, but it’s not immediate), balanced by the disadvantage of paint colours changing as they dry. I like the textures that textile work allows – the different qualities of threads and fabric, the way the stitches are worked, the three dimensional nature that results. Painting in gouache and watercolour can suggest texture or mimic texture but generally aren’t textural in their nature. Threads are round and sit on or pass through the surface. Is there anything you would like to change or develop? I enjoyed and was excited by the layered cross stitches I did in my second sample in Stage 6. I would like to try taking that idea further. Overall, I simply need to keep practising, trying things out – as suggested in the course notes. I haven’t been working regularly in my sketchbook. When working on a project, especially in the earlier stages when working on paper, it feels like doubling up. Yet I know how useful it can be, to follow up other work (eg the lemon) or as input to later work (eg the Monet colour analysis). I’m wondering if it would also be a useful shift of focus when I am working on a project, along the lines that it is often good to walk away from something for a while and see it with fresh eyes. So I’m going to make a serious attempt – at least 10 minutes every day. Current count: 2 days. A final note: I’m current reading a book by Sebastian Smee about Picasso and Matisse (mum bought it when we visited the Picasso exhibition). Smee writes about the influence on Matisse of Paul Signac, “… the most convincing of Seurat’s Neo-Impressionist followers” (page 30). The leader of the Divisionists, Signac “… applied pure colour in discrete, highly organised cells, following an almost scientific system of local complementaries and overall harmonies” (page 32). I’d never heard of Divisionism, but from a brief check in wikipedia I gather it is a variant of pointillism with a more technical, colour-theory based approach. In writing about Matisse’s shift from Divisionism to Fauvism Smee explains that Matisse realised “…that the effect of colour, its intensity, was crucially bound up with the size of any given area of colour.” “The problem with Divisionism … was that breaking colour up into discrete dabs or points created an overall haziness which – for all the rhetoric one heard about the primacy of colour – actually diminished colour’s potential effect” (pages 63 and 64). I’ve been trying to think through implications of this, especially given the exercises in Stage 6. Perhaps it is that for all the theory and techniques we may learn or develop, there is no silver bullet or formula. Thoughtful, purposeful choices informed by experience, knowledge, and intuition, selecting the most appropriate answer for the current, particular question is the goal. Perhaps. Racing along, no time to dawdle. I really wanted to extend some of this colour work with felting – pretty much infinite flexibility in proportions of colour in the mix, and you can’t get finer mixing than individual fibres. But if I do that I’ll either fall behind my preferred schedule or have to skimp on something else. Darn. Onwards. At this point the course notes suggest looking at the work of Seurat and the technique of pointillism. One of the colour books I’ve been reading recently is “The art of colour” by Itten. As well as the now-standard illustration of colour theory using squares of colour etc, this book has the really nice feature of large colour plates of works of art accompanied by comments on colour use and design. It includes (pp 112-113) Un Dimanche à la Grande Jette; preliminary study by Georges Seurat. 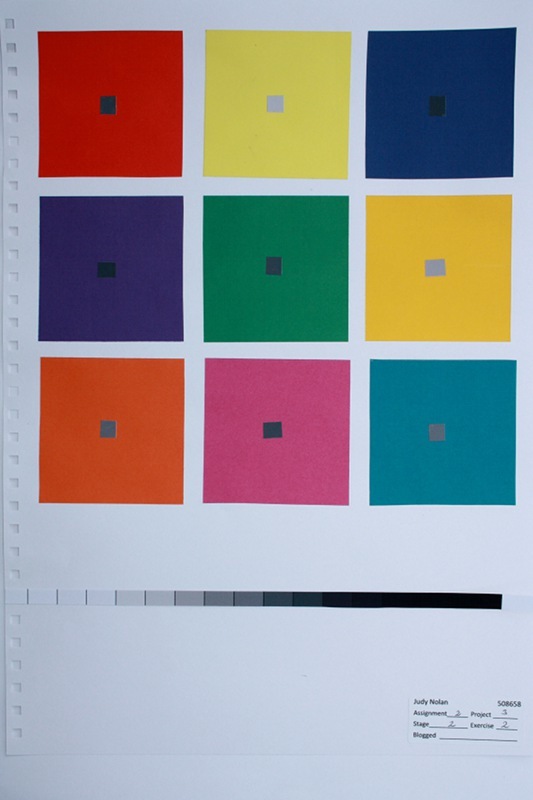 Itten points out the use of dots of pure colour, the importance of complementaries, and the balance of light and shade. “The individual colour areas are resolved into restlessly vibrating modulations of contrasting tones”. John Gage in “Colour in Art” includes a detail from A Sunday on La Grande Jette (using the title given in the book), in addition to other works by Seurat. Gage also highlights Seurat’s interest in tone in addition to the luminosity provided by optical colour mixing (pages 54-55). In particular, the comment “Seurat must have been impressed by Blanc’s description of Delacroix’s hatchings of pink and bright green in the flesh painting of the cupola…” (page 53) influenced one of my choices in the samples below. I can’t remember whether I’ve mentioned in a previous post how important the concept of optical colour mixing can be for a weaver. If they are of different colours, the crossing of warp and weft creates many dots of colour, and understanding and taking advantage of this is one of the basics of weave design. It’s very common to weave colour “gamps”, precisely to explore colour interaction. I did a detailed study earlier this year of the interactions of just three particular dye colours, culminating in a colour gamp shawl. Click on the thumbnail to go to the final post on that. The shawl itself doesn’t work as a colour design, but as an information source it is fantastic – over 1,000 colour combinations! The requirements for this stage are all stitch, not weaving (which I’m really missing), and I went back to hand stitching to form dots of textile colour. My stitching went a bit crooked, but this first sample is meant to be two rows of work, each with colonial knots placed widely, then closer, then very closely. Size 5 perle cotton was used in the first row. The apparent colour lightens and brightens as the knots move closer together. The shine and texture of the thread shows clearly and attractively against the matt black fabric (a moderately heavy cotton twill – I call it “drill”, but am not sure if that’s correct). 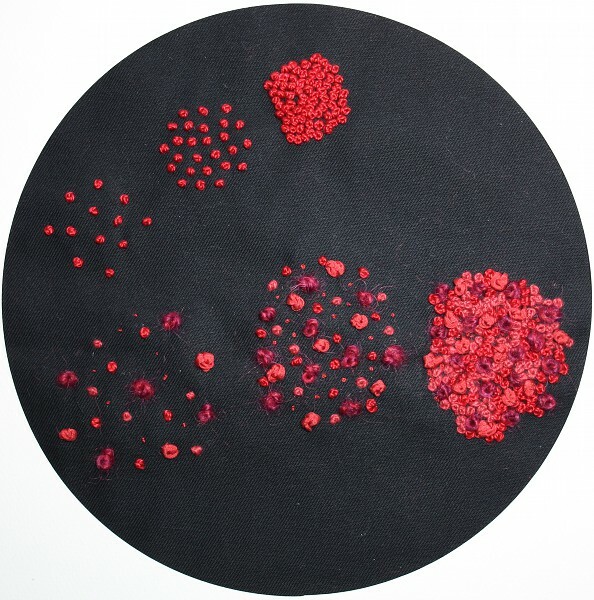 The second row has the same perle cotton (shiny), plus a mohair/wool/alpaca yarn (“mirage” from Bendigo Woollen Mills – larger and hairy), cottolin (matt), silk ribbon (some sheen, larger), and a fine silk thread – in a range of reds. In the wider-spaced area the differences in colour, size and texture are very apparent. Overall the effect is quite dull. The central section appears lighter and brighter. On the dark, dull background the differences in yarn size have reduced impact. It would be interesting to compare the result on a lighter fabric which could show shadow more. The differences in colour seem greater. In the closely stitched area I spaced the larger yarns fairly evenly, but worked the smaller ones in little clumps or rivers. As I was working this seemed to let each individual type of yarn keep some of its individuality, while still forming a cohesive whole. It also seemed to make it easier to include and still see the very small silk thread knots. I like the result, although I think it has a more formal and traditional appearance than I would normally prefer. The different sizes and textures of the yarns produce an interesting surface and combine with the variation in colour to give a rich surface. The second sample uses some of the Lunatic Fringe 10/2 cotton. I chose the colours – 10-red purple and 5-green – thinking of the quote above about cross-hatching in pink and green to produce flesh tones. Straight lines were again a challenge, but in theory there are three rows of stitching, moving from bottom left up to the right. 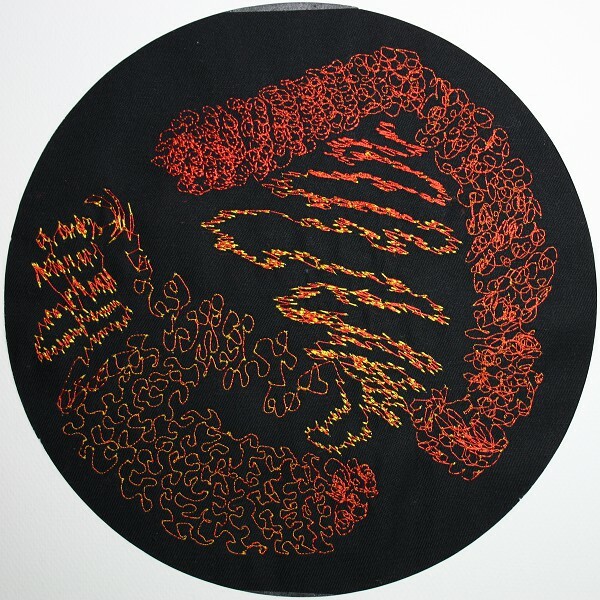 The sample is small – the circle of fabric is around 11 cm diameter. 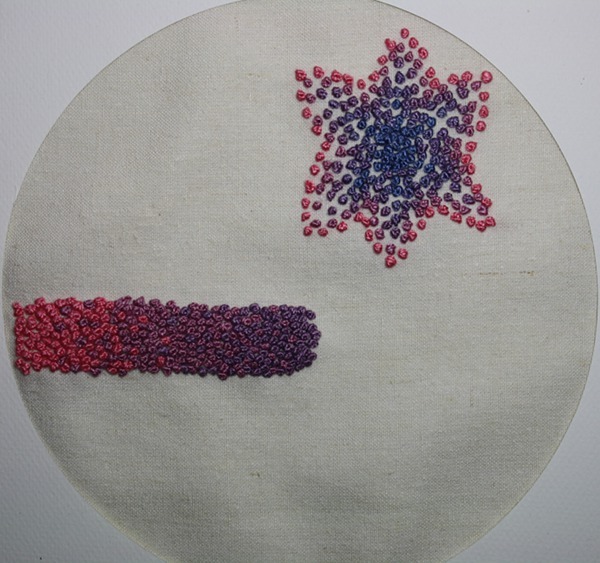 First are patches of the two base colours, using the thread doubled. 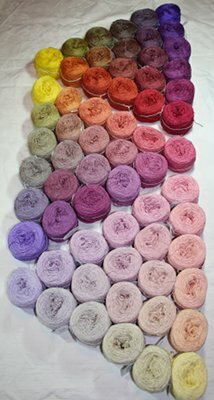 The second row is a series of 50-50 mixes of the two colours. Going from left to right and down, there are clear bands of colour then an even mix (both sets with yarn doubled). I wasn’t getting much optical blending, so I tried the two colours together in the needle – effectively the same total grist, but very mixed colour. In the fourth patch I used the threads separately and undoubled – back to the even mix, but smaller knots. At this scale the bands and large even mix remain two distinct colours, which look marginally more intense to me. The two colours in one needle produced the most mixing of colour, but is a bit dull and uninteresting. The smaller scale section is the most successful in blending colour but retaining some individuality and liveliness. Top right are two 80-20 mixes, both in single-thread knots. The colours don’t really blend or shift, but I like the extra pop that the contrasting colour provides. The course notes asked for pastel colours, mixing for a gradual colour movement across the sample. I decided to use some of the 20/2 silk I dyed back in January (seen here), at 1% depth of shade and in particular the run from Red 2 B to Navy R (lanaset dyes). Feeling the black background had drabbed down the earlier stitching I moved to a creamy fabric which I think is a cotton-hemp mix. I started with the bar on the left, using three different colours – 100% Red 2B, 80% Red 2B/20% Navy R, and 60% Red 2B/40% Navy R. I think I was quite successful in gradually introducing each new yarn, but the work was very slow. I dropped my original intention of using the full run of 6 colours. Instead I decided to try a less densely stitched sample with the colour change radiating out from the centre. Wanting to complete the Project by the end of the weekend (that didn’t happen obviously!) I decided to limit myself to one length of each colour (that is, one “needle full”) and one hour (which turned into one and a quarter). I think the colour movement combined with the decreasing density of stitching creates an interesting but harmonious starburst. For the final section of work I went totally off the requirement. 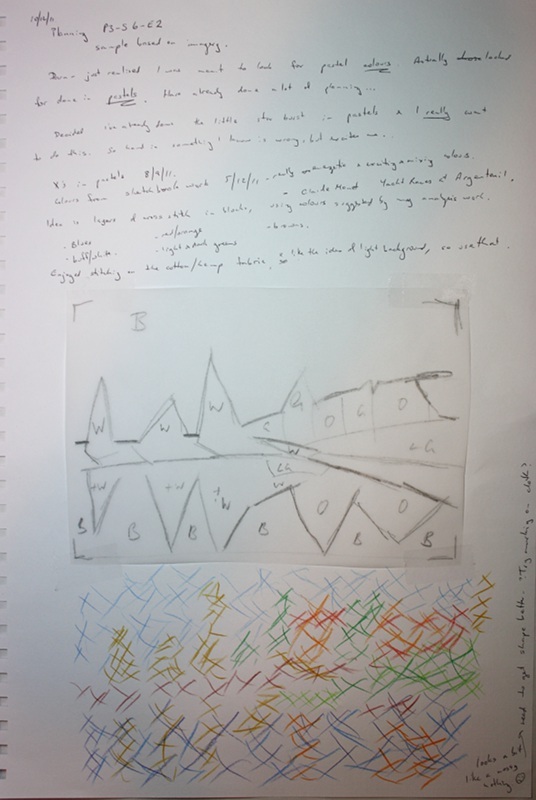 It started with a simple mis-reading of the notes, which called for “a drawing with pastel colours to develop in terms of image making”. Looking back at the context, this clearly means pastel colours. 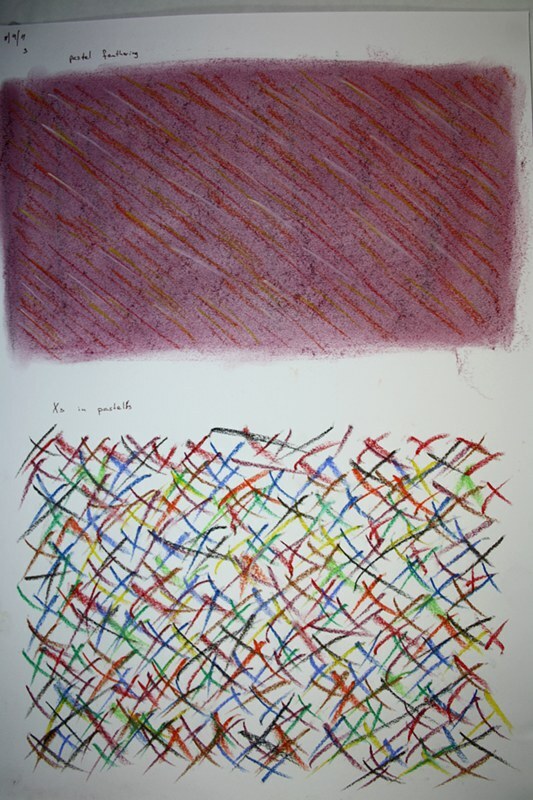 I read it as pastels the medium, and found this page done in September in Project 1. I was really attracted to the lively mixing of colour, and especially the idea of doing some lively freeform cross-stitch – No More Knots!! I didn’t want a flat overall mix of colour, and had the idea of using some of my recent sketchbook work. 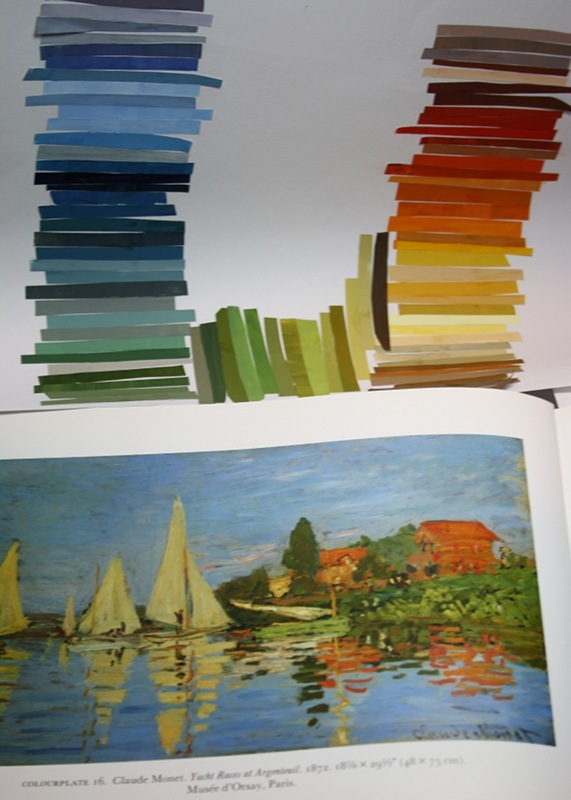 Earlier this month I did a colour study of a work by Monet – “Yacht Races at Argenteuil” (Kapas, page 48). 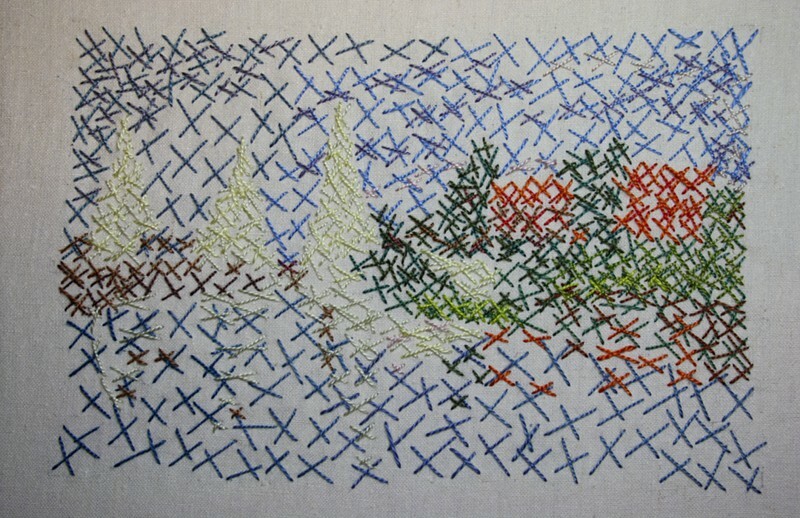 I got very excited about the idea of doing some stitching using lively overlapping cross-stitches of colour, based on the design and colours of the Monet work. I got out the sketchbook to plan it out, referred back to the course notes to check what I needed to do – and realised my error. These were certainly not pastel colours. Some pacing around the room later I decided I didn’t care. The Plan was relevant to the material being covered in the course, I wanted to try it – the course would just have to bend a little. I used tracing paper over the plate in the book to get the basic shapes of the image. I didn’t want to reproduce it in any sense, just to get some blocks of colour mixing happening. Next came a quick tryout of the idea using coloured pencils. The result was very muddled and it looked like I would have some trouble with level of detail and scale of work. However I was feeling very committed to the idea and wanted to give it a go. I decided to use the same creamy cotton-hemp fabric as a base. Threads chosen were all my hand-dyed 20/2 silk. Here is the result. It’s not finished and it never will be – I’ve run past my (personal) deadline, I need to build up the colours differently (starting bolder and refining with later layers), the scale and detail is challenging (no surprise there! ), and if I were going to do a finished piece I would want to start with my own design. Regardless of all that, I really enjoyed the work and I like it – or at least the potential of the idea. It’s hard to see in the photo, but where the stitches are layered (particularly the building and greenery middle right) it is starting to get that lively complex mixing of colour. I keep insisting that I’m not a stitcher, but I really hope I get back to developing something like this in the future. Well, this has turned into a very long post, and Tuesday evening instead of Sunday – but the project is pretty much done. A final overview and I’ll be on to Project 4 – Developing design ideas. Colour exploration continued in this stage, moving back into stitch. I needed to select two primary colours, work on a black background and experiment with proportions and placement to see the impact on the apparent colour. I chose yellow and red as my colours. 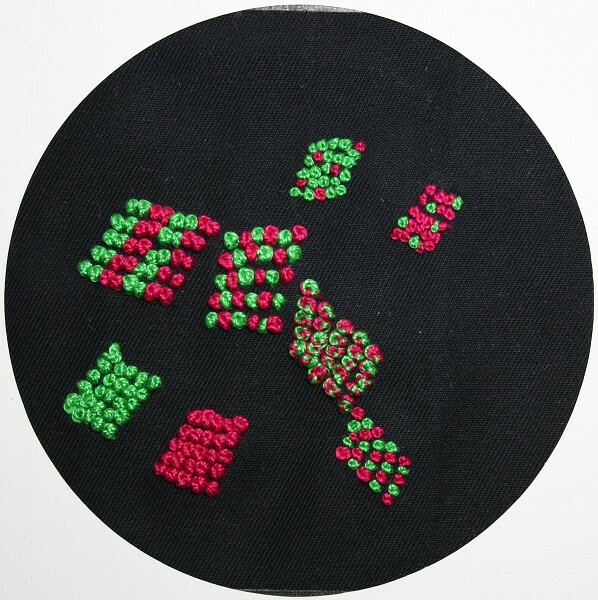 Wanting to continue a mix of hand and machine stitching, I decided to use the machine and to start off with the 10/2 mercerised cotton from Lunatic Fringe (I discovered back here that my sewing machine is quite happy to use these direct from the cone). The set of colours includes two reds (10-Red is marginally towards yellow, 5-Red is marginally towards blue) and two yellows (10-yellow is lemony, 5-yellow is more golden). The top few lines of the sample is just a check of tension settings and a try of cottolin to see if the machine liked it and if it would give a more matt finish. The machine wasn’t keen and the look wasn’t hugely different so I didn’t continue with cottolin. My comments on the samples are based on looking at the original under a “daylight” lamp (it’s a dull, rainy Sydney afternoon outside). Unfortunately the colour of the photos have shifted a bit. Using the numbering on the photo, in section 1 I tried the two closer primaries – 10-Red and 5 Yellow. Proportions of each colour remain constant throughout – 50/50 – but the distance between varies. In the wider spaced area to the right the yellow looks slightly more lemony than on the cone and the black around it very faintly greenish. The red looks unchanged from the cone. On the left they combine to give a variegated orange effect. The red is not individually apparent at all – it looks orange. The yellow retains some individuality throughout. The impact varies depending on distance and angle of viewing. Typing at my desk and looking across at the sample lying on the worktable, the background fabric is hidden by the closer stitching. 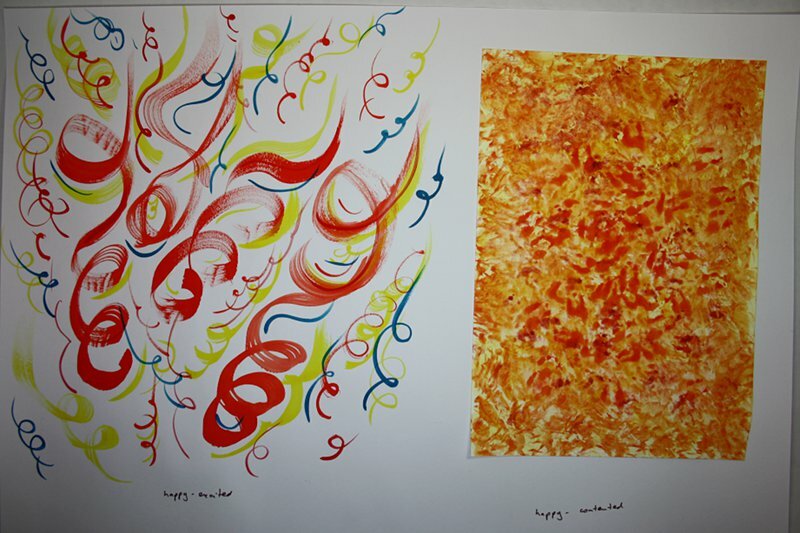 The red and yellow are hard to focus – the effect is a textured orange. The next experiment was combinations of the slightly different yellows and reds, plus I’d read about long machine jump stitches on Claire’s blog (her post here, describing a class with Pamela Priday) and wanted to see if I could do something similar (I don’t know Pamela’s technique unfortunately). The thread on top covers some of the thread below, changing the visible proportions. Combo 2: 10-Red over 5-Yellow. A rich combination. From a distance the colours blend to a textured orange. Closer, the colours enrich each other. Combo 3: 5-Yellow over 10-Red. From a distance the red is not apparent. The yellow appears shifted towards orange. Closer, the two colours remain distinct but the yellow dominates and seems to have an additional glow. Combo 4: 5-Yellow over 5-Red. The yellow is fractionally cooler, the red looks slightly dull. Combo 5: 5-Red over 5-Yellow. The red is shifted slightly to orange, the yellow is shifted slightly green. Combo 6: 10-Red over 10-Yellow. The red is distinctly shifted towards orange. The yellow isn’t changed. Combo 7: 10-Yellow over 10-Red. The red is shifted, but looks dull. The yellow is unchanged. Combo 8: 10-Yellow over 5-Red. Neither colour appears changed. Combo 9: 5-Red over 10-Yellow. The red has shifted towards orange. The yellow is unchanged. Overall the differences are slight, but the 10-red and 5-yellow combination looks more harmonious and shows the greatest and richest mixing of colour. The yellows tend to dominate in all combinations, and the 10-yellow shows no impact from either red. 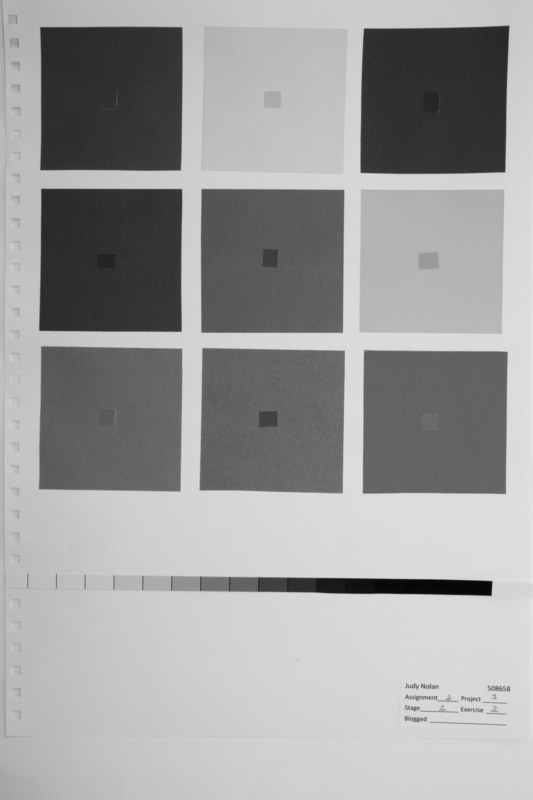 The large scale of the cross-hatching limited the amount of optical colour mixing. 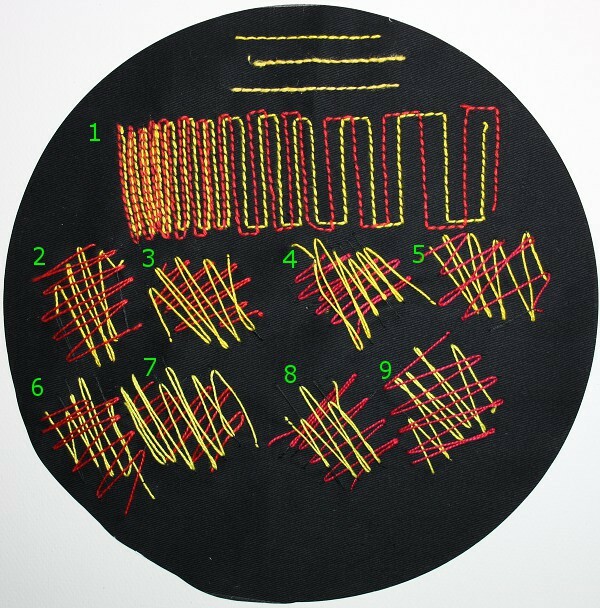 I moved to rayon machine threads, red in the needle and yellow in the bobbin. The red is on the orange side, the yellow is golden. The first run goes from top left, clockwise around the perimeter. I gradually tightened the top tension. At the beginning no bobbin thread is visible. As the stitching progresses first tiny pin-pricks then dots of yellow bobbin thread start showing. I kept going until I reached maximum needle tension, which still wasn’t pulling up much bobbin thread. While at the machine I was disappointed. The lighting there is not good and I couldn’t see any change in the apparent colour. In better light there is a subtle but distinct shift in apparent colour, gradually moving to orange as the yellow bobbin thread takes effect. The second run starts at the bottom and moves clockwise. I had loosened bobbin tension and was able to get much more yellow bobbin thread to the surface. I had the machine running quickly and the stitches are very small. The rayon looses all sheen and just looks dull. There is actually a sick green tinge, presumably be the influence of the black background with the more open stitching pattern. Middle left I went into a frenzied zig-zag motion (by moving the frame, not using the machine stitch), trying to get more solid areas of yellow visible. This leads on to the central meandering zig-zag part, which I think is the most interesting, energetic and successful section. I like a line that manages to be jagged and smooth at the same time. I was also able to get some good colour change by modifying the needle tension, effectively changing proportions of yellow and red. The colours mix and work together well, but still retain some individuality which I think adds to the interest. This Stage goes beyond the objective recording of colour to consider the personal – intuitive responses, likes and dislikes, associated moods and feelings. I’ve just finished reading Colors: what they mean and how to make them by Anne Varichon which is full of information on the symbolism and significance of colours across cultures and history. One theme throughout was the strong association between cost/rarity/difficulty to produce and symbolism. For example “For many years, green’s appreciation in the West was marked by the failure of green dyes, and as a result, it retained connotations of risk, transience, and instability” (p 207). Colour is easily available to us now and there is so much mixing of peoples that maybe such cultural sharing and knowledge of colour symbolism is lost. A lot of marketing effort and dollars suggest I’m wrong on that. On reflection, I’ve lived most of my life in temperate Sydney where most of the garden stays green all year round and snow never falls, yet I’m still very clear on “proper” colours to represent seasons – so yes, culturally shared symbolism of colour is alive and well. On the other hand, my instant reaction to a particular light and dark blue as “boring” is definitely personal and related to years of school uniform. No conclusions here, so on to the exercises! Exercise 1 asked for three pairs of opposite words and colours to express them – sad/happy etc. A quick half hour should do it. I found this really hard and got totally stuck. At the top on the right is my first pair – ill and well (I’ve had a cold!). Not a good result – my “ill” could be someone else’s “muddy spring”, and “well” is rather feverish. Plus the expressive mark-making is all over the place. Figuring out the colours I wanted, mixing them and making meaningful marks was just too much to think about all at once. The bottom section of the page shows sad and happy. I was feeling much more pleased with this, especially that it seemed natural for happy to expand and take up lots of room, when suddenly it looked very familiar. This is work from stage 2 of project 1. The “sad” from that time is pretty similar too – vertical lines and drab colours. So why did I find it so hard, when presumably (one hopes) I’ve learned and progressed in the meantime? Successive contrast – the afterimage in the complementary colour. The seven colour contrasts – hue; light-dark; cold-warm; complementary contrast; simulataneous contrast; saturation; contrast of extension (harmonious areas yellow 3 : orange 4 : red : 6 : violet 9 : blue 8 : green 6). Way Too Hard. I gave myself a bit of a shake and tried Agitated/Calm. “Calm” doesn’t quite ring true, but I think I nailed “Agitated”. 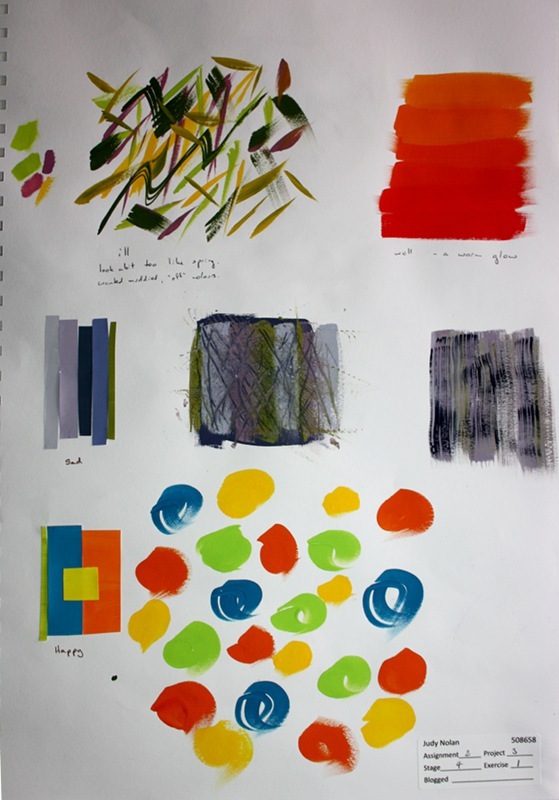 Exercise 2, identifying a colour mood or theme and making a “colour bag” really was the “quick and direct way of creating a bridge between source material and textile work” that the course notes suggest. It was fast, fun, and effective. Definitely something to play with again. In my last post I was a bit disappointed with my colour mixing and had a Cunning Plan to simplify by using collage rather than mixing paints. The idea was to concentrate on identifying the colour I was seeing and select a match from my collection of painted papers. Each time I do a colour mixing exercise I paint any remains on some paper, which is later stored by colour in a series of envelopes. The flaw in the Plan was quickly apparent – I didn’t have any of one of the major yellow I was seeing. I have around 40 different yellows in the Yellow envelope, similar numbers in the yellow-orange and yellow-green envelopes, and none of them were the right yellow. 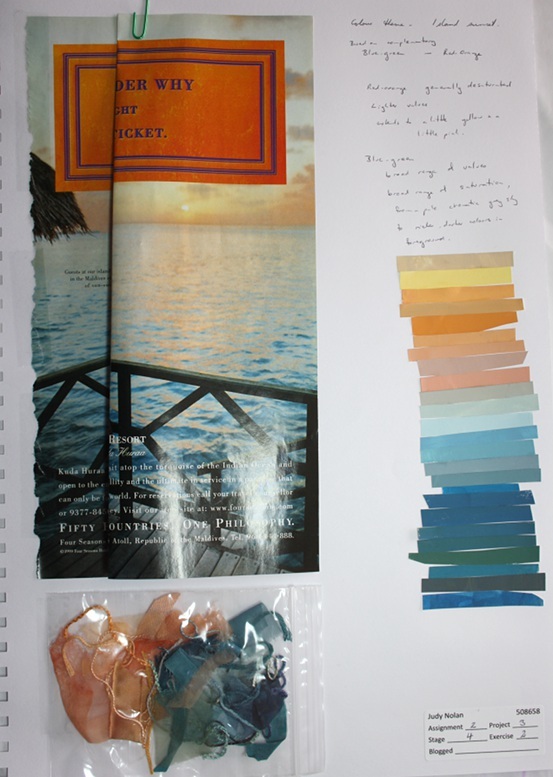 I then came up with Cunning Plan B. I mentioned The new Munsell student color set in this post listing colour books. The set includes 264 colour chips that you assemble on Hue/Value/Chroma charts. Very useful, but of course only a small fraction of the full colour space. 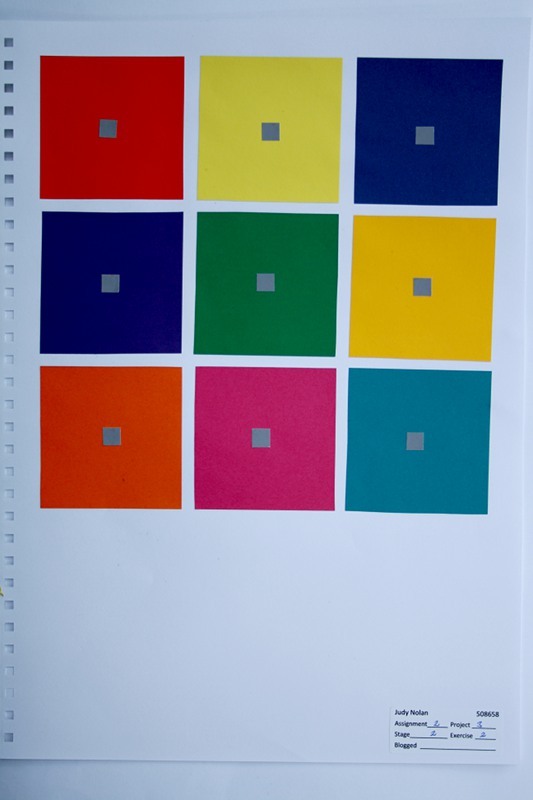 I wanted more when I did the exercise (this is a few years ago), so I created and printed a series of 40 A4 pages, each one showing a different hue in a table of 9 values and 7 saturations – 2,520 colours. Cunning Plan B was to look at my object, refer to the printed pages to find the right colour, print that out and use the result in the collage. Interestingly (to me at least!) 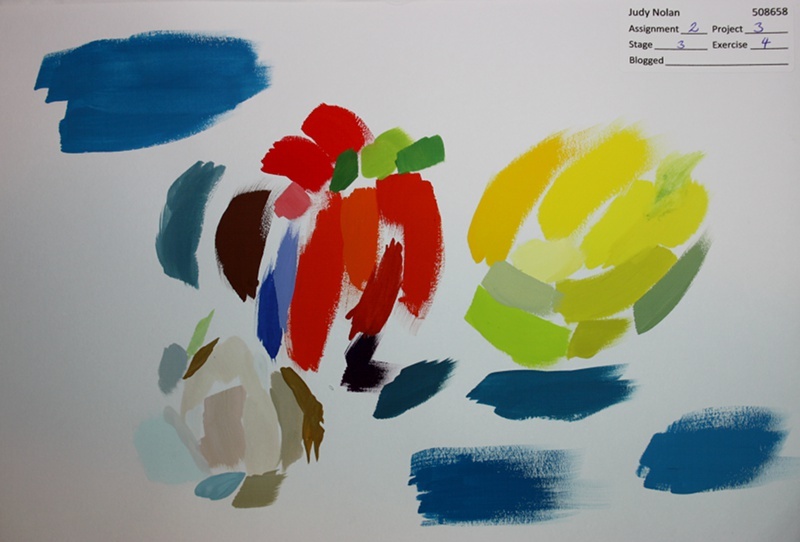 once I identified the colour I wanted in my colour table I was able to get a clearer idea of how to mix the paint. This was also helped by reading Claire’s post about exercise 2, where she wanted to shift hue, but achieved it using a smidgen of complementary colour. Cunning Plan C was born. A mix of lemon and cadmium yellow, some white and the smallest hint of purple was what I needed. Here is a compilation photo showing clockwise from top left: the selected colour printout, leftover paint ready to go into my collage envelope, my object (the lemon, although without its blue background), slightly left is the collage attempt with the gap where no yellow was right, then down to today’s mix of yellows which were just what I wanted (ie Plan C), and today’s print of selected colours ready for collage (Plan B). Plan C was the winner – just what I was looking for. It was basically the colours I played with back in exercise 1, but much, much, much finer steps in the mix. I was surprised that Plan B didn’t give me quite what I wanted. For whatever reason (different inks or paper or possibly even printer), the colour printed today didn’t quite match the colour I printed and stored a few years ago. This has been a challenging Stage, which continues as I attempt to record my results. Most of these photos I took inside under a “daylight” lamp with no flash, partly for convenience (the sun is playing with the clouds) and partly because this is the light under which I work. Reasonable light for work, not good for photography – improving my setup has been on the to-do list for a while. This was further time spent mixing colours, both intense saturated colour and the duller and paler colours. I started with one of my favourite combinations – lemon yellow and violet. On the left is the page of paint mixing (gouache). On the right is a photo of the dyeing I did back in January which developed into the colour gamp shawl. The same colours are in the back row. You can see more of the shawl in a series of posts including this one. I didn’t spend a lot of time on the exercise, although I did buy and try out some acrylic paints for the first time. The gouache paints come in small tubes and I tend to work in dinky little amounts with them. I’m hoping the larger acrylic tubes will help me to become a bit more expansive and free in my painting. Another example of the brain and eye influencing each other, like the stage 2 colour perception experiments (and the size of dinner plates vs appetite). This required glueing down an 8 cm square piece of patterned fabric, then mixing paints to match around the edges. My fabric stash is mainly solid colours or hand dyes, so I bought a fat square of quilter’s cotton – rather ugly, but the best I could find in a lunch break. Mixing and matching colours, allowing for colour change on drying etc is very tricky. I used a hairdryer on little samples at the edge of the page and still didn’t get anything spot on. This took the idea one step further. Instead of a printed fabric with a limited number of colours, we were asked to mix colours that we could see in a postcard or image. I used the cover of an old calendar, an image of central Australia. I really love the colours in the image. Overall I am fairly happy with the colours I was able to mix, with the exception of the irritating yellow ochre that I carelessly put over the background rock colour. I wanted it next to the middle ground brown. Given the scale and detail of the photo, it was difficult to select specific colours to mix. The focus was meant to be on recording colour, not trying to copy the image. Given the recent experience of the interaction of colours next to each other, this seemed harder in some ways. I kept colours generally in the same relative positions as the photo, just to help keep track of what was going on. The biggest thing missing in my attempt are some of the darker tones in the foreground. Now the jump to matching colours from three dimensional objects. 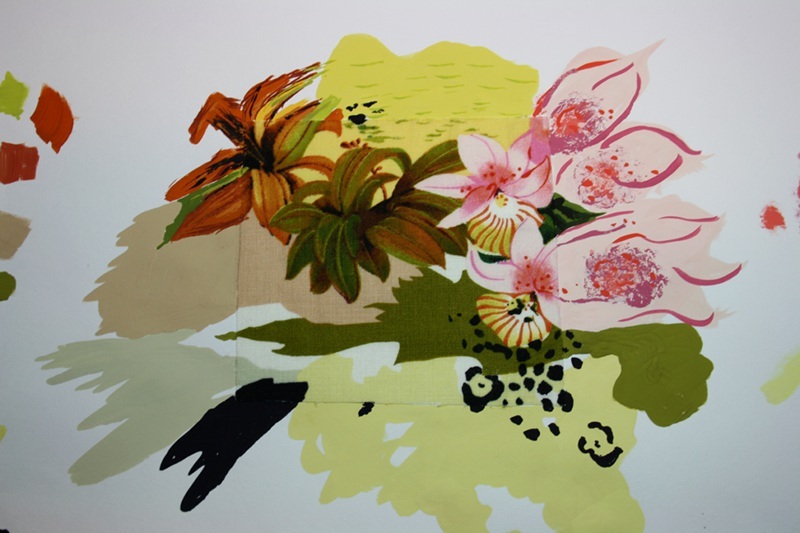 We were asked to put a few objects on a piece of coloured paper, spend some time looking and concentrating on the colours seen, and mix and record them as brushstrokes of colour. This is my first attempt. Those few dabs of paint are the result of maybe 90 minutes of effort! It was really difficult to look at the colours – I kept getting that shimmery effect from after images etc. Plus there were just so many colours in those pieces of fruit, even before any reflections or interactions. I couldn’t manage with the amount of input, so ended creating a small peephole in a piece of mid-grey paper and holding that in front (being careful not to block any light). Finally I realised the late afternoon light through the window had entirely changed the colours I was seeing and I gave up in disgust valiantly retreated to regroup and fight another day. Given yesterday’s struggle I wanted to simplify as much as possible. 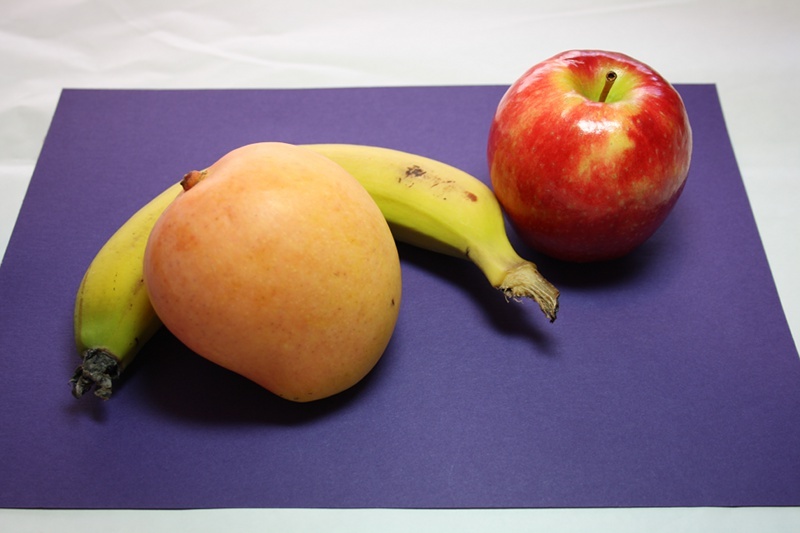 The vegetables are much more consistent in their colouring than the fruit. I also propped up some white cardboard behind, to reduce the influence of light from the window. The course notes suggest spending as long as one can on the exercise, and I decided 2 sessions of 1 hour each was a fair goal. The blue in the top left shouts badly – it was the last thing I did and I didn’t take enough care. Generally there was a tendency to mix a colour, adjust it a little, then say “can I see this somewhere? Good enough”. 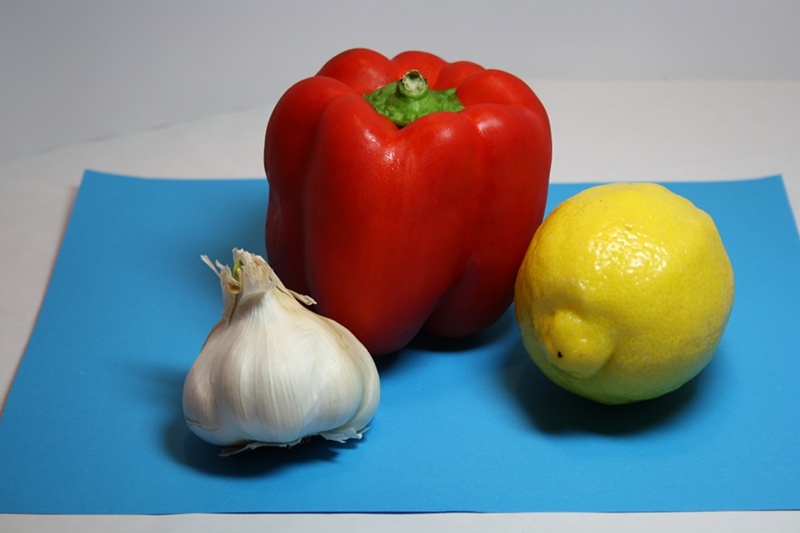 I’m pleased with the garlic, not so much in these photos but in life I thought it a good result. Overall this Stage was much more difficult than I expected. I’ve done quite a bit of colour mixing in the past (in dye mostly) and I generally like my results. One major difference is that I don’t try to match – not even a previous dyelot (after all, even large commercial ventures tell you to buy enough wool in one dyelot for the whole jumper). 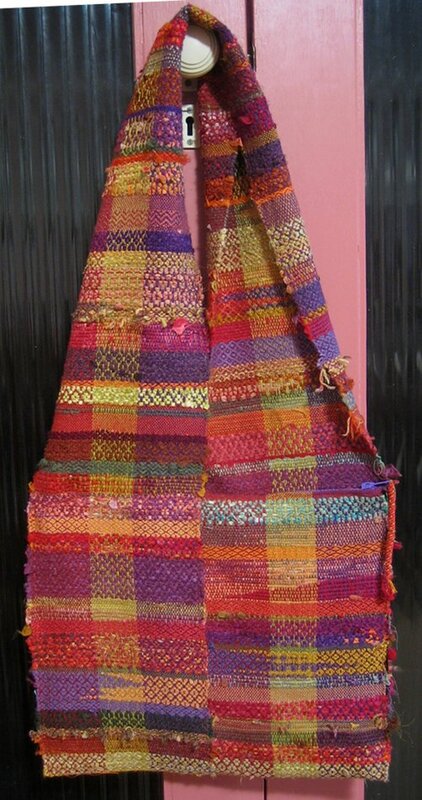 Another is that I tend to go from memory and emotion – for example the bag on the right was woven on the theme “autumn” (more on that project here). The next Stage is Colour moods and themes which might come more easily, though I won’t count on it. I want to keep working on my colour recording, so I’ll do some followup in my sketchbook. 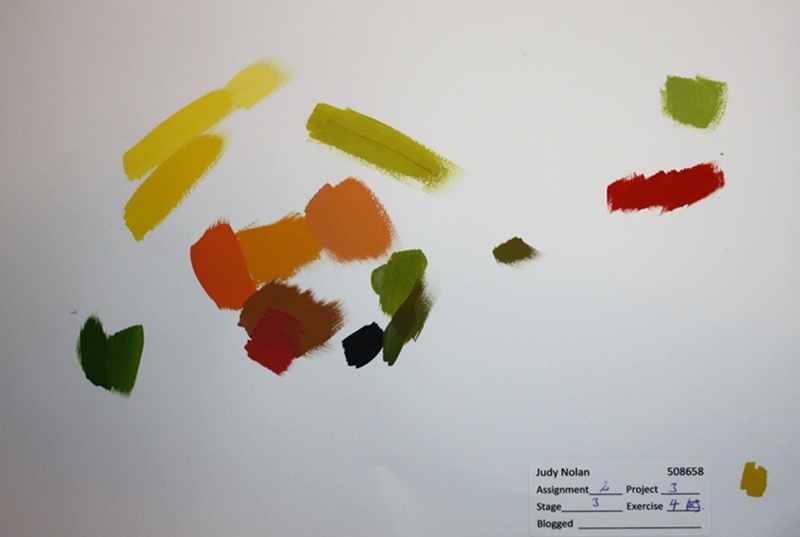 The class exercises combined colour observation with colour mixing. I’m planning to simplify further by working in collage. 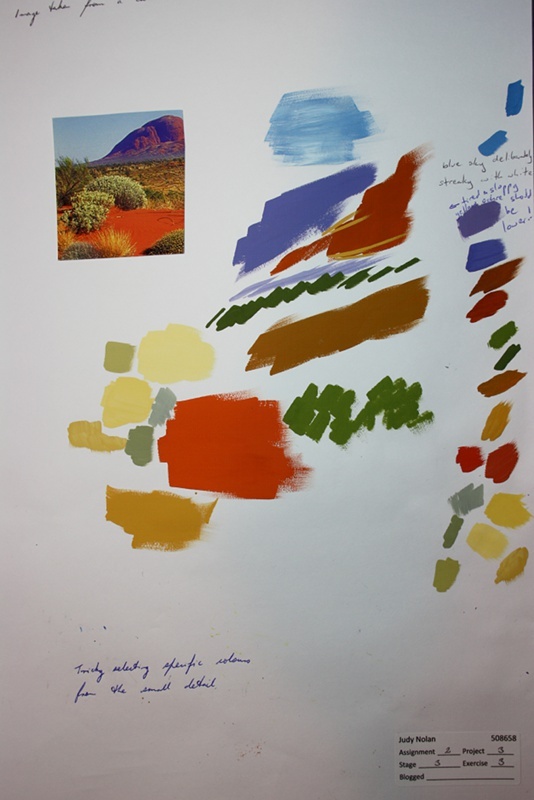 The course notes begin with a very brief introduction into the huge topic of colour. 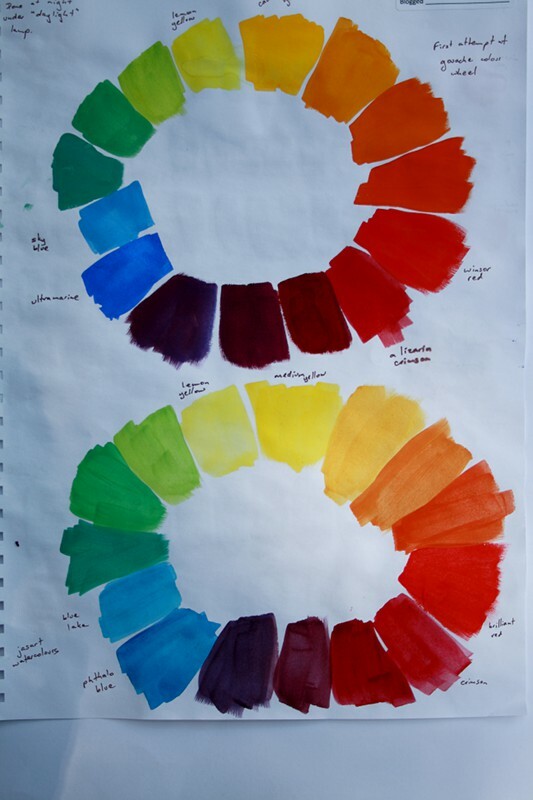 I tried some quick mixing of paints to create colour wheels, first in gouache then in watercolour. 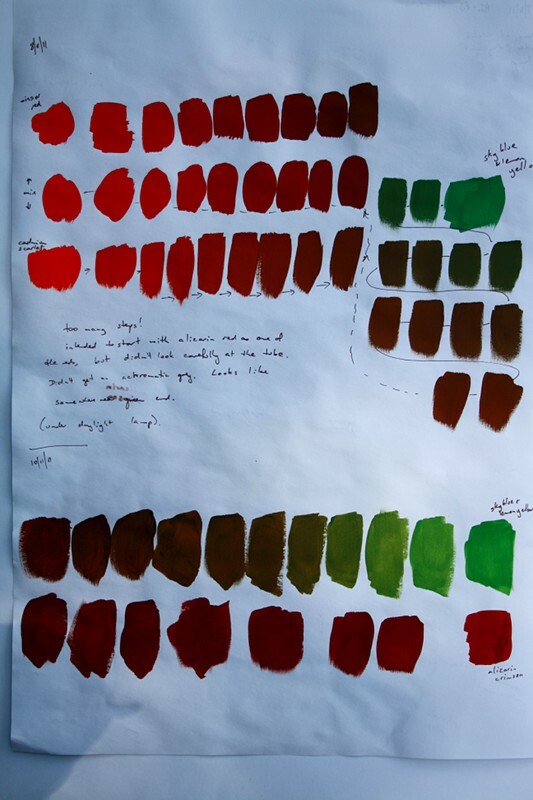 I already had some gouache paints from starting the exercises in David Hornung’s book and was familiar with the idea that pigments have a colour bias or overtone. 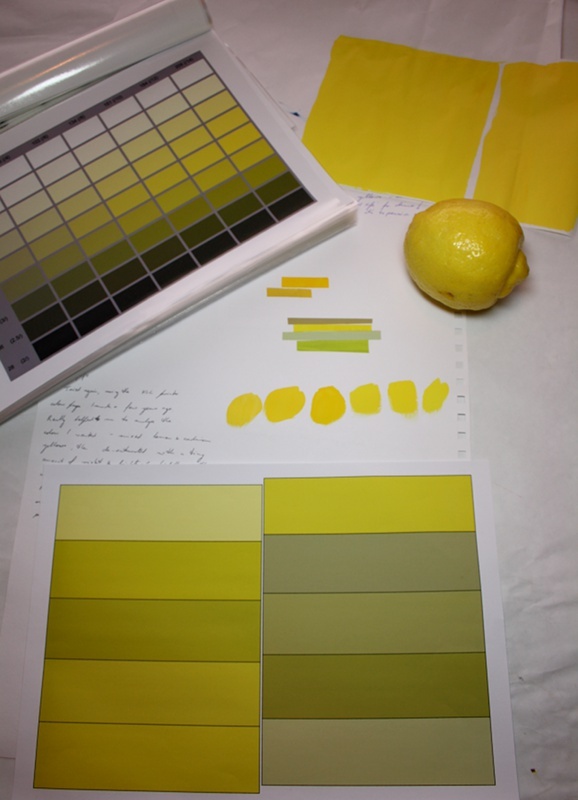 I used six co-primaries, to get the most vivid colours when mixing – for example lemon yellow when mixing green and golden yellow when mixing orange. 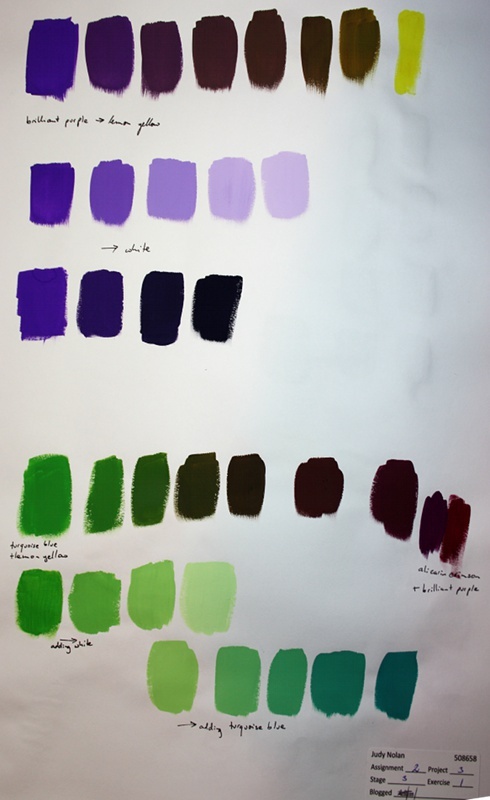 Both types of paint went reasonably well, except for lack-lustre violet, and to quote Hornung (page 17) “when the goal is a ‘pure’ violet, those obtained through mixing will always be a little disappointing”. The first exercise looks at the interaction of colours. I think I got some good variations in the turquoise squares in the top set and the red in the bottom. My camera had some issues processing the colours – in particular the line around the turquoise on red is not apparent in life and doesn’t appear to be a shadow. Observations and my interpretation: The turquoise on lemon yellow looks dark and drab (influence of the much higher value of the yellow). On the blue-violet it is much brighter and more saturated (difference in value – the hues a not so different which is interesting), while it is almost lost on the green (just too similar). On the dark red it looks most like its “real” colour (difference in value, close to complementary colours). The red looks dark and dull on the golden yellow. It is unexciting on the pale blue and lost on the fuschia. It appears lightest on the dark violet. It looks most pure and saturated on the green, its complement. In the second exercise we needed to put a small grey square onto different colours. 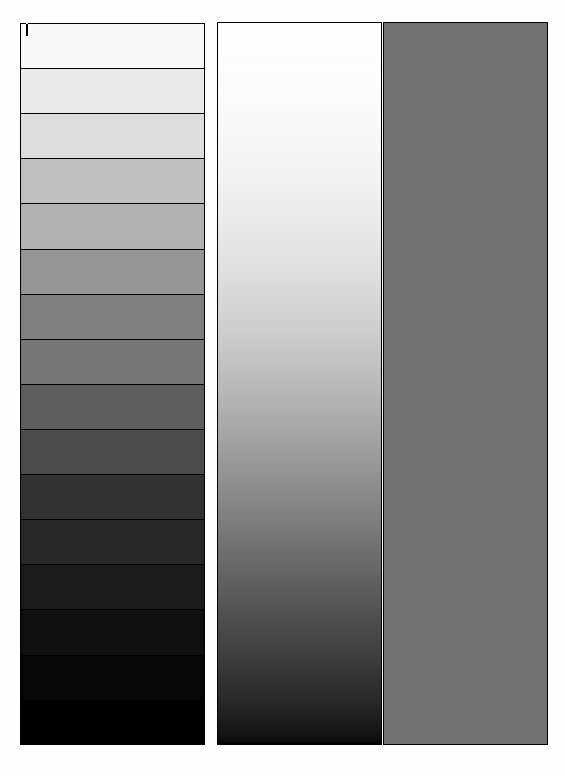 When looked at hard, the grey should appear a little different – a tendency to the complement of the surrounding colour. I searched quite a few shops but wasn’t able to find paper or card in a flat, mid grey. There would be a blue or green or red cast, or only dark and light, or a textured effect. In the end I used Word to create a white to black gradient and a series of distinct values of grey, and printed it on matt photo quality paper. Then I found the point which appeared to me between “light” and “dark” and used that for my grey squares. The result (above) was disappointing. I could talk myself into the square on the red looking a little green, but I wasn’t convinced. 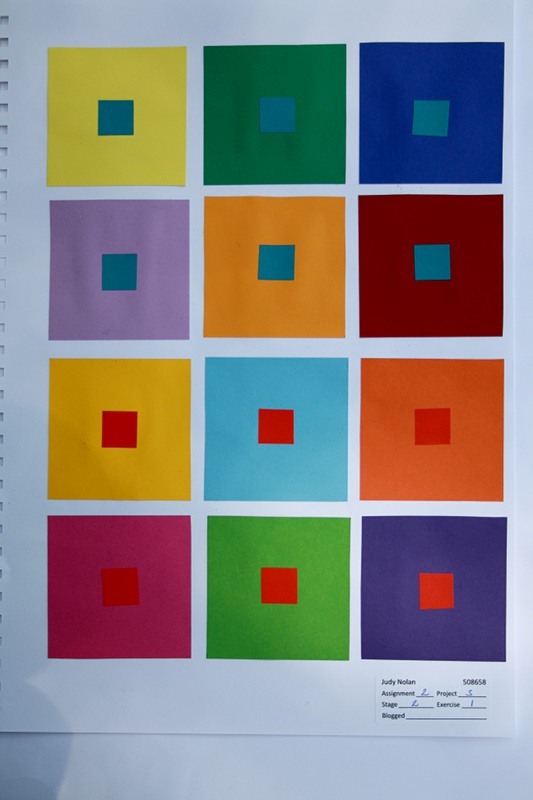 Then last night reading Itten (p. 53) I found “When achromatic colors occur in a composition and adjoin chromatic colors of like brilliance, they lose their achromatic character. If the achromatic colors are to retain their condition of abstraction, the chromatic colors must be of different brilliance. … When gray is used as an active component in a color composition, then the adjoining chromatic tone must match the gray in brilliance” (using the bopk’s spelling (bah!) and “brilliance” being close if not the same as “value”). So I tried again, this time using different grays trying to match the value of each background colour. Here is the result, in colour and in grayscale to see how close I got to the matching value. Generally my matching wasn’t too bad (better than I expected), with the exception of the fuschia. To manage complexity I stuck with the discrete sequence of greys I’d already printed and often I had to choose between lighter and darker. The exciting part is that when I stare at one of the grey squares I really do start seeing a tinge of the complementary of the surround. I can’t do one after the other, my eyes seem to get tired of the game. Still, very pleasing.